MARTIN COUNTY, Fla. — For seven months, Martin County detectives watched Ruimei Li and Lixia Zhu, two women accused of running a prostitution ring out of Treasure Coast massage parlors. But according to recently unsealed search warrants, Li and Zhu weren't the only ones being watched . 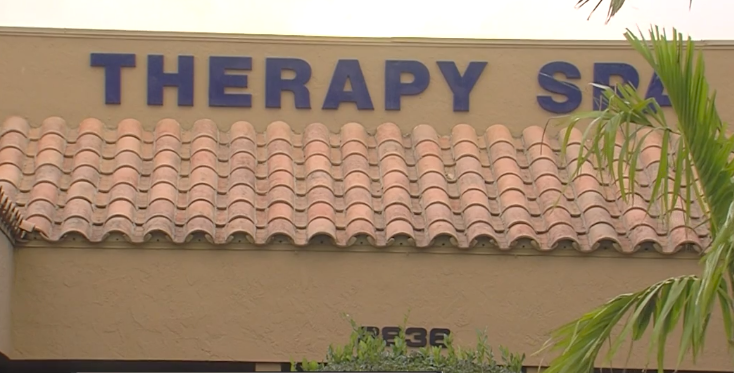 The search warrants, otherwise known as "sneak-and-peek" warrants, gave detectives the go-ahead to walk inside Bridge Day Spa in Hobe Sound and Therapy Day Spa in Stuart, and secretly install hidden cameras inside ceiling tiles. “We had law enforcement personnel pose as repair persons to be able to get in and to install the cameras,” Snyder told Contact 5’s Merris Badcock. Several law enforcement sources told Contact 5 sneak-and-peek warrants are actually easier to get than wiretap warrants, but sneak-and-peek warrants can only be used if detectives have tried all other investigative techniques available. “We did not monitor any women who went into the parlor,” said Snyder. “We just assumed they were there for legitimate purposes. The same type of warrant was used up and down the Treasure Coast and in Palm Beach County to ensnare alleged madams of local massage parlors. In total, more than 300 people were arrest in the multi-agency sting, including New England Patriot’s owner Robert Kraft. While these types of warrants are legal, Martin County detectives had to agree to strict rules, like stopping any recordings that displayed legal activity. Per the warrant, detectives were not allowed to monitor for more than 30 days. However, one local law firm representing more than a dozen accused "johns", believes the video recordings were obtained illegally. Attorneys with Kibbey-Wagner recently filed a motion to keep the videos out of evidence in at least four cases out of Martin County. We checked the paperwork. The search warrant applications clearly ask for monitoring and recording permissions in the title of the document. However, the judge’s order granting those permissions only uses the word "monitor," not "monitor and record." “We feel if you ask for A, B, and C, and you only get A and B, logic would tell you that you weren’t allowed to get C,” Wagner told WPTV’s Meghan McRoberts. “In this case, they asked for monitoring and recording and the judge’s order only says monitoring. Since Snyder sat down with Contact 5 before this challenge was made, we asked his office for a statement about Kibbey-Wagner's motion to suppress the video. A spokesperson told Contact 5 via text message, "We had the proper paperwork with the proper verbiage." As a result of the sneak-and-peek evidence, deputies charged nearly 100 “johns” and arrested six women in the case, but they have yet to charge anyone with human trafficking . That does not mean his office has given up on trying to get those charges. But Snyder believes even without them, the investigation was meaningful for the community and the women he says they rescued as a result. In total, 14 search warrants were unsealed including others which went after bank accounts and allowed detectives to install tracking devices on cars. Kibbey-Wagner also represents clients in charged in Palm Beach County. They have not decided whether or not they will file a similar motion to suppress the video evidence as they are still waiting on all the paperwork in that case. They told WPTV they expect the judge to hear their motion in 30 days or less and said a decision could come as soon as the same day.